Hello everyone!One thing that I think all miniature painters have in common is that we all want to speed things up. I enjoy taking a long time on a miniature now and again, but I always end up happy when they are finally finished. I would like to start a series of articles here on "speed painting". Please note that this series is intended more or less for good looking "tabletop quality" minis, but some aspects can easily be applied to competition quality pieces.For lesson 1, I will be expanding on the importance of custom colors. This is not merely mixing colors on your pallette, but actually mixing whole pots of color. The advantage of this is that you can have each of your highlights ready and at hand at any time, and will always have the exact match. 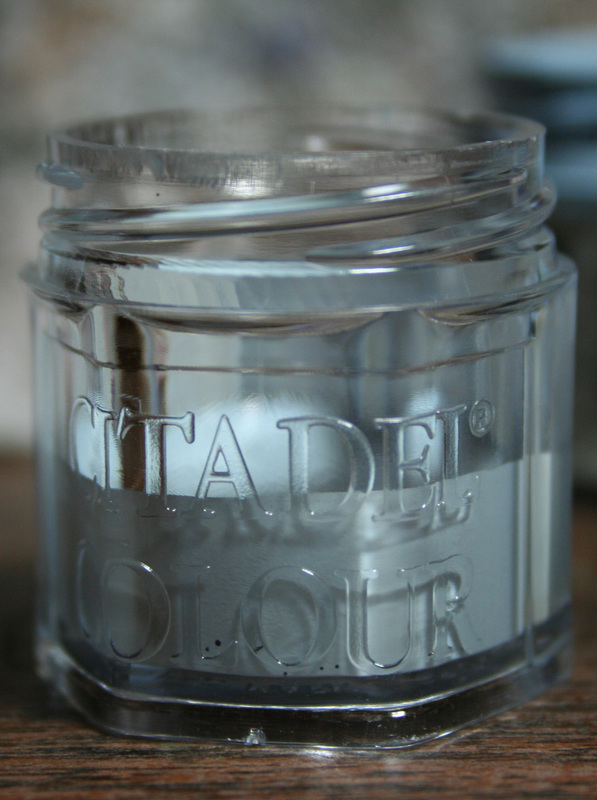 This is particularly useful for painting armies and squads.In addition, there are just some colors that are a great compliment to your range of paint. I will explain some of my favorite recipes later.For now, I will show how I mix pots of color. 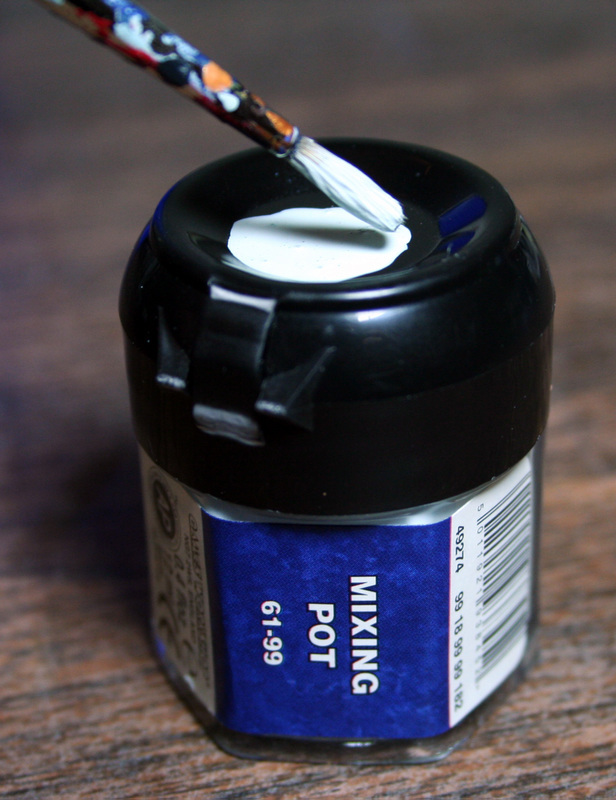 I recently started to run low on one of my favorite old GW colors, Elf Grey, so I decided to mix up a new pot. 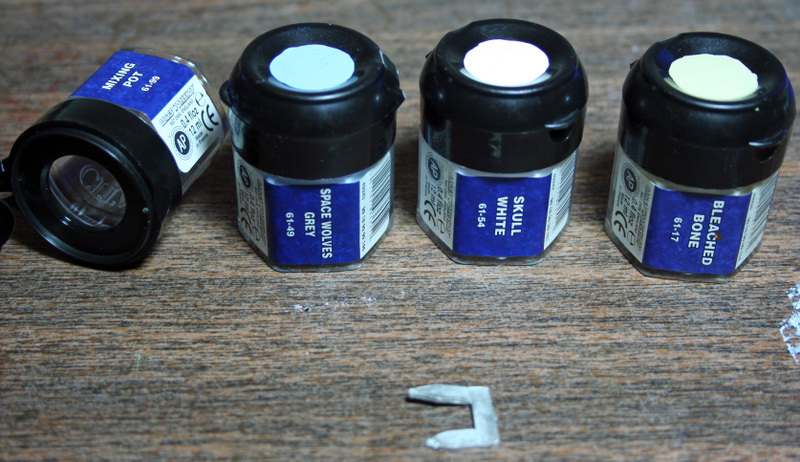 Here are the materials:-Empty Mixing Pot-Space Wolves Grey-Skull White-Bleached Bone-Metal Sprue (For making an "agitator" to aid in mixing). Now we will begin pouring the colors into the empty mixing pot. The recipe I found that is pretty close is 50% Space Wolves Grey, 25% Skull White, and 25% Bleached Bone. 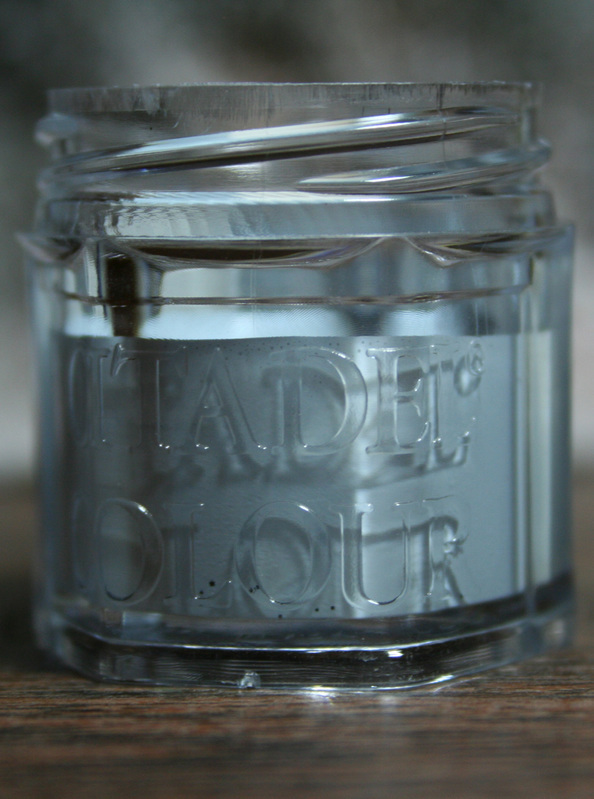 I would highly reccomend adding some water and thinning each of these colors slightly, to aid in mixing and pouring. 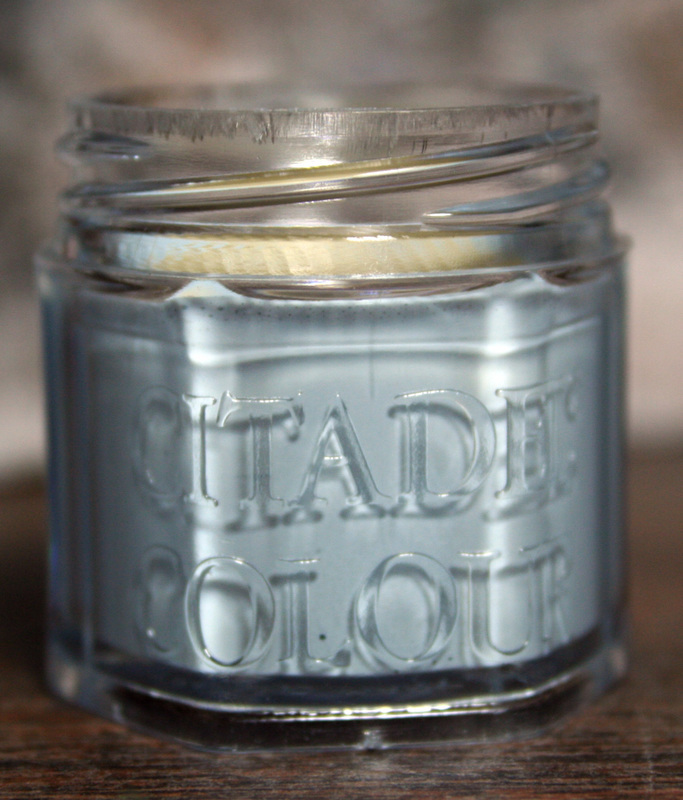 Make sure to screw off the lids; leaving it on and pouring paint out will quickly become a disaster!1. 2. 3. 4 (Image 1): Here you can see that I added in the Space Wolves Grey, nearly up to the halfway point. (Always pour less than you need, you dont want to overfill the pot! This is helpful in the image 4 commentary below). (Image 2): Now I added Skull White. (I am estimating the amounts I am pouring in, but you could use an eyedropper or something similar to measure). (Image 3): Here I have added the Bleached Bone. The paint is near the top of the pot. Add the piece of metal sprue, screw on the top and shake it for about a minute. Thin with more water if necessary. (Image 4): The test! On the left, I have some of my original Elf Grey, and on the right is my match. It looks pretty close, but it needs a little more Space Wolves Grey. Since the pot is not all the way filled, I have room to add more paint for adjustments. Here is the finished product. I like to paint the color on the top, so I can easily find it in my mass of paints. If you want, you can even tape a piece of paper with the color name on it and tape over the label.So with mixing colors in this way, we can easily replicate old colors that are no longer in production.Most importantly, we can make mixes for each "stage" of painting highlights on a miniature. 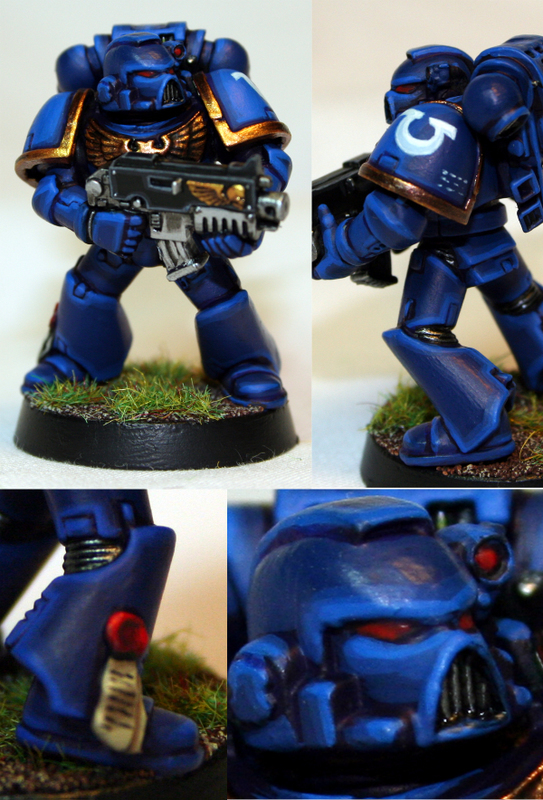 For example, this tabletop quality Ultramarine was painted with GW blues and my blue mixes. First was Midnight Blue, then Regal Blue, Followed by a mix of 66% Regal Blue and 33% Enchanted Blue, then 33% Regal Blue and 66% Enchanted Blue, and finally Enchanted Blue. With the aid of several mixes, I had to do no mixing on my pallette, and this miniature was painted in less than an hour! 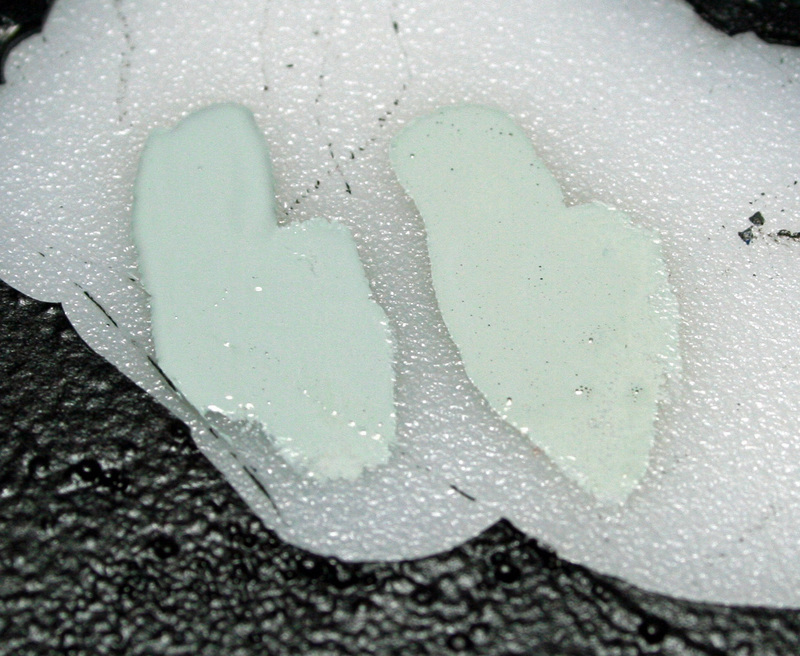 This technique can also be used on competition quality pieces. For example, my Army of the Dead entry used several custom mixes made in spare pots, as well as my Space Marine Librarian (Both of which can be seen in my gallery). This is helpful because I have colors mixed that I can blend up to in stages, rather than constantly having to add white into a darker color for each highlight, I can blend from color #1, to color #2, to color #3, and so on.Here is a list of some of my favorite mixes, that I use on a regular basis:-50% Chaos Black, 50% Scorched Brown (Great as a basecoat for leather, skin, and most of all red).-50% Chaos Black, 50% Codex Grey (A must have for painting NMM, and highlighting black).-50% Foundation Khemri Brown, 50% Bleached Bone (Good for basecoating light cloth, purity seals, and skulls).-50% Bleached Bone, 50% Skull White (A great off-white color, useful when you want to preserve certain spots for pure white).-50% Red Gore, 50% Blood Red (This makes a nice, bright red that is not orange looking. Add a fleshtone to highlight this).-50% Boltgun Metal, 50% Chaos Black (Good basecoat for metallic areas).-75% Burnished Gold, 25% Mithril Silver (Final highlight for gold and bronze areas).-66% Regal Blue, 33% Enchanted Blue (First highlight after Regal Blue).-33% Regal Blue, 66% Enchanted Blue (Second highlight after Regal Blue).-50% Enchanted Blue, 50% Space Wolves Grey (Highlight for Enchanted Blue).-50% Fortress Grey, 50% Skull White (Good highlight mix for NMM, it's bright, but allows you to preserve certain areas for pure white).I hope my article is easy enough to understand, and most of all helpful! Thanks for reading! -MattP.S. another segment will come in the next few weeks.